Last month, my father and I took a 5-day motorcycle trip to the Gunflint Trail to ride, relax, and do some fishing. If you're not familiar, the Gunflint Trail is way up in the northeastern tip of Minnesota. 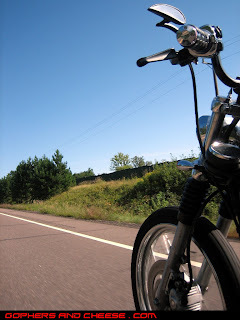 You basically ride north, past Duluth, along Lake Superior until you reach Grand Marais (not far from the Canadian border) and then ride northwest along the trail. 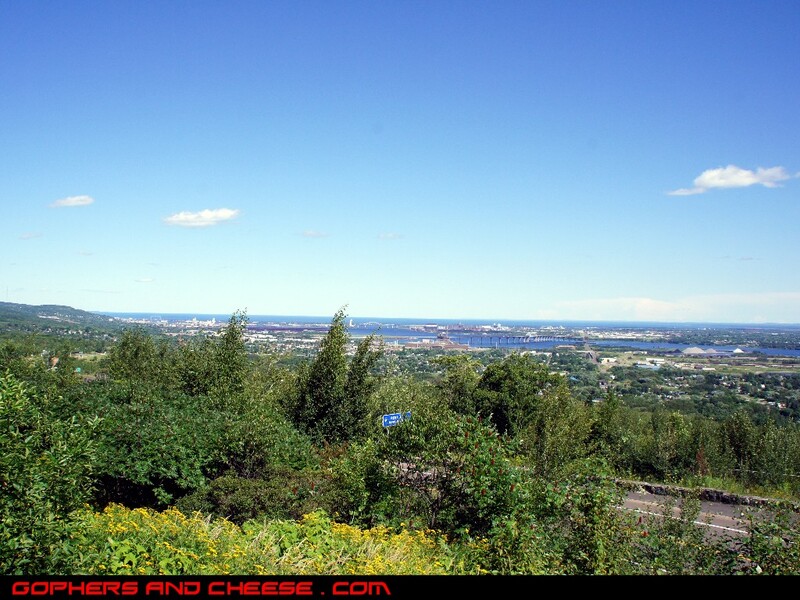 It's a beautiful area of the state and it was my first time there. We had a great time and I'll share a bunch of photos from the trip over a series of posts. Here's a map of the direct route taking I-35. It's about 300 miles or 6 hours if you take that route. We came back that way in one day but we broke the ride up into 2 days. 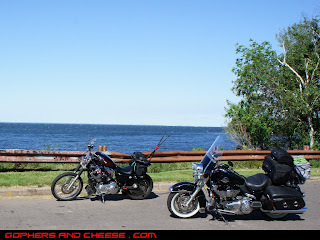 Day one, we headed due north and rode around Lake Mille Lacs before cutting east and stopping for the day in Duluth. Day two was a more leisurely ride up to our lodge on the Gunflint. Days 3 and 4 were spent around the lodge. Day 5 was our return trip. We headed north from the cities on MN-47. I rode my Sportster and my father rode my Road King. 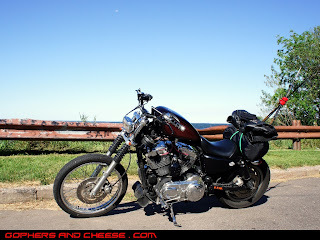 Here is the Sporty at an overlook by Lake Mille Lacs. 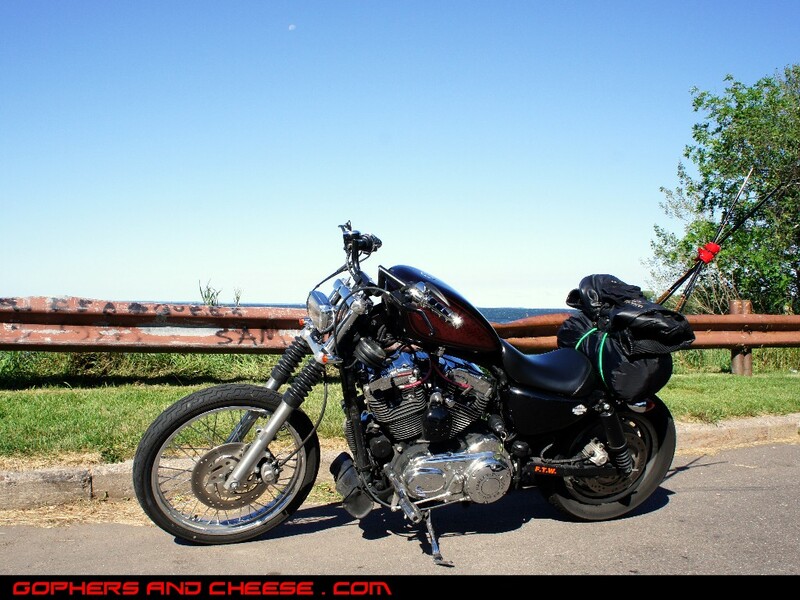 Note the two fishing poles secured to my sissy bar. Here's a shot of both bikes. You can see that I let my father carry the majority of the luggage. 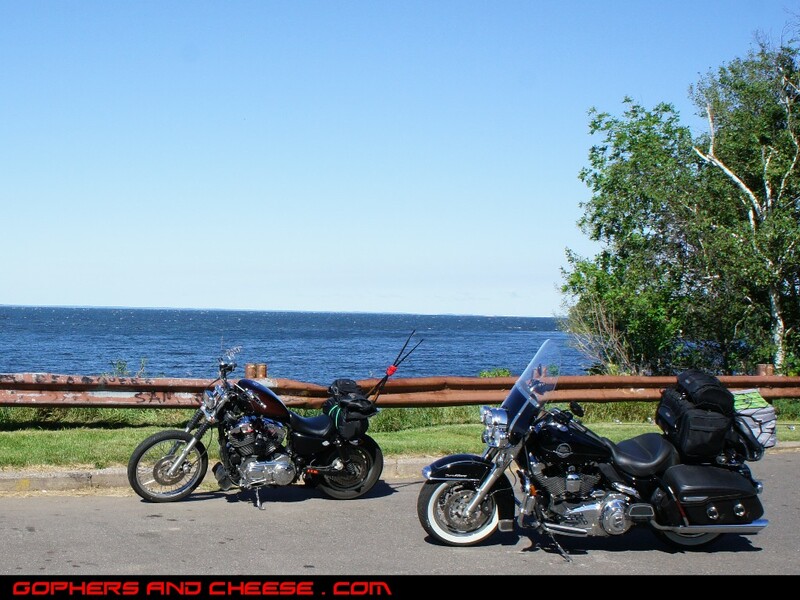 We grabbed a late breakfast along the lake in the town of Garrison. 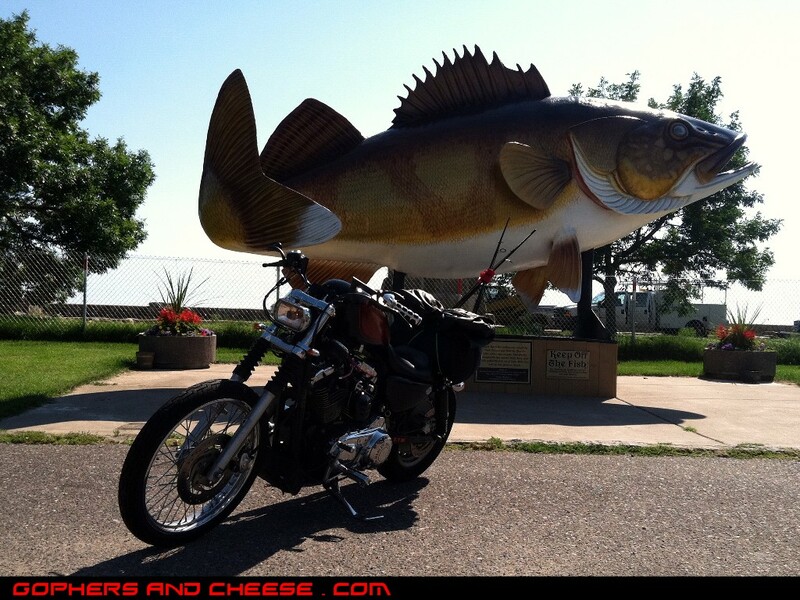 Here is the giant walleye in Garrison. We headed north of the lake and connected with MN-210E. Here is an action shot somewhere along the way. We hit I-35 just south of Duluth. We checked into our hotel (this was not a camping trip). 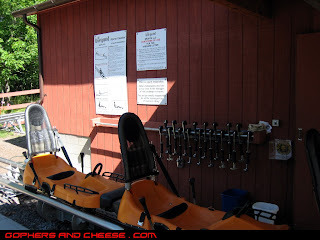 Then we went over to Spirit Mountain and I rode the alpine coaster - something I really wanted to do. It's like a go-kart on rails. It was fun and a novelty but it was not scary at all in spite of never touching the brake. 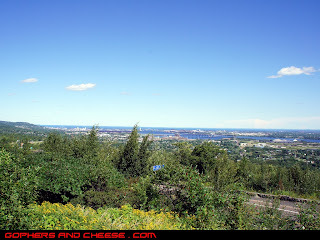 I'm glad I rode it and I would recommend doing it once but I don't have a strong desire to ride it again. 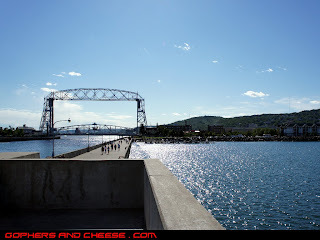 We headed into downtown Duluth for dinner. 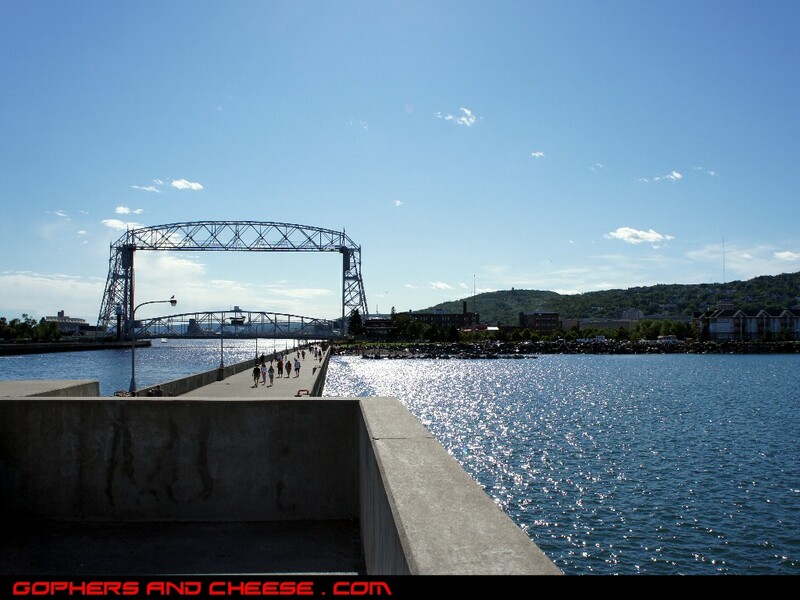 Here's a view of the famous lift bridge.